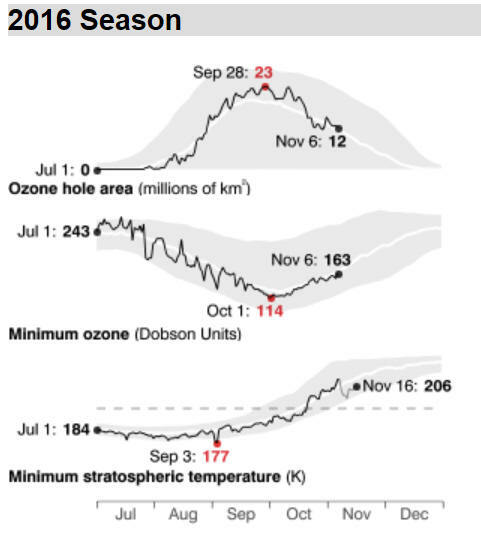 NASA Ozone Watch Ozone Hole update-This graph shows the variations of ozone from year to year. The red bars indicate the largest area and the lowest minimum value. The year-to-year fluctuations are superimposed on a trend extending over the last three decades. Antarctic ozone today: The 2016 ozone hole is filling and shrinking, with lowest amounts, now around 170 DU, over Dronning Maud Land and the Weddell Sea. It is quite elliptical, with the axis running from the Antarctic Peninsula towards South Africa. The hole, at around 9 million square kilometres, covers over half the continent, and is broadly comparable in size to 2014. Outside the polar vortex, ozone values are highest over the Southern Ocean, particularly south of Australia where they reach nearly 400 DU. There are significant differences between the various satellite measurements. Temperatures in the ozone layer are mostly rising rapidly and are generally close to or a little above the normal. They have risen above the PSC formation threshold of -78°C throughout the ozone layer. The PSC area has declined to zero, at about the usual time over the last decade. The ozone hole is expected to split over the next few days to leave a small remnant over the Antarctic Peninsula and Weddell Sea. The 2016 ozone hole: The polar vortex formed over the winter, isolating the ozone layer over Antarctica. Stratospheric temperatures fell below -78°C through much of the ozone layer, leading to the formation of polar stratospheric clouds. With the return of sunlight ozone depletion took place leading to the formation of the 2016 ozone hole. 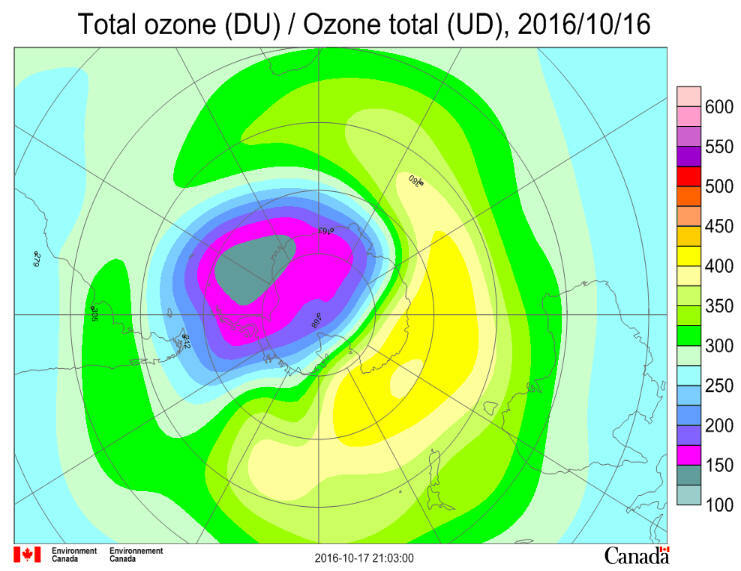 Ozone values dropped to around 130 DU at the centre of the ozone hole in early October, but were around 360 DU just outside the polar vortex. During August the ozone hole was larger than in either 2015 or 2014, but during September it was smaller in size than 2015, though mostly larger than 2014. In the first half of October it was comparable to the decadal mean at around 19 million square kilometres. A short lived warming took place in early September. At its largest in late September the hole covered just over 20 million square kilometres. The PSC area reached its maximum size of around 26 million square kilometres in early August broadly comparable to the mean of the last decade. It shrank and the PSC area was around 15 million square kilometres in mid September, near its seasonal lowest over the last decade, however it remained near this size into October, then rapidly fell to zero. The edge of the ozone hole clipped the tip of South America, the Falkland Islands and South Georgia over September 1 to 5 and September 12, 27 to 30, October 8 to 15. At its peak on Sept. 28, 2016, the ozone hole extended across an area nearly three times the size of the continental United States. The average area of the hole observed since 1991 has been roughly 10 million square miles. In 2015 the ozone hole grew to 10.9 million square miles, 2 million square miles larger than this year, before returning to relatively normal summer levels. Its larger size last year was due to colder-than-average temperatures in the stratosphere that amplified the destruction of ozone by sunlight reacting with chlorine and bromine from man-made chemicals, scientists said. In 2016, warmer stratospheric temperatures constrained the growth of the ozone hole. At its peak on Sept. 28, 2016, the ozone hole extended across an area nearly three times the size of the continental United States. Ozone, which occurs naturally in small amounts in the atmosphere, is comprised of three oxygen atoms as opposed to the two that make up the much more abundant molecular oxygen.. High in the stratosphere, roughly 6 to 30 miles above the surface, the ozone layer acts like sunscreen, shielding Earth from potentially harmful ultraviolet radiation that can cause skin cancer, cataracts and suppress immune systems, as well as damage plants. Ozone is also one of the primary greenhouse gasses that regulate Earth’s temperature. First detected in 1985, the Antarctic ozone hole forms during the Southern Hemisphere’s late winter months of August and September as the sun’s rays return after months of polar night. The sunlight initiates catalytic reactions that produce chemically active forms of chlorine and bromine concentrated over the South Pole during winter. These reactions rapidly destroy ozone molecules. In addition to the area of the ozone hole, scientists also measure the concentration of ozone that would be found in a column of atmosphere extending from the surface to the edge of space. The most common unit for measuring ozone concentration is the Dobson Unit, which is the number of ozone molecules that would be required to create a layer of pure ozone 0.01 millimeters thick at a temperature of 32 degrees Fahrenheit at an atmospheric pressure equivalent to Earth’s surface. This year, the ozone layer reached a minimum concentration of 114 Dobson Units on Oct. 1, 2016. In 2015, the ozone layer reached a minimum of 101 Dobson units on October 4. During the 1960s, before the Antarctic ozone hole occurred, average ozone concentrations above the South Pole ranged from 260 to 320 Dobson units. This year’s Antarctic ozone hole is similar to the 2013 hole which reached 9.3 million square miles. Although warmer than average stratospheric weather conditions reduce ozone depletion, the current ozone hole area is large compared to the 1980s, when the depletion of the ozone layer above Antarctica was first detected. This is because levels of ozone-depleting substances remain high enough to produce significant ozone loss. NASA and NOAA monitor ozone levels via three complementary instrumental methods. NASA’s Aura satellite and NASA-NOAA Suomi National Polar-orbiting Partnership satellite measure ozone from space. The Aura satellite’s Microwave Limb Sounder data are used to estimate chlorine levels. NOAA scientists monitor the thickness of the ozone layer and its vertical distribution above at the South Pole station by regular releasing weather balloons carrying ozone-measuring “sondes” and with an instrument called a Dobson spectrophotometer. In 1987, the Montreal Protocol on Substances that Deplete the Ozone Layer began regulating ozone-depleting compounds, which are slowly declining. Scientists expect the ozone hole to recover back to 1980 levels around 2070. Antarctic ozone today: The 2016 ozone hole is beginning to fill, with lowest amounts, around 150 DU, over Dronning Maud Land. It is roughly three-lobed and offset from the pole towards the Atlantic Ocean. The hole covers over half the continent and is shrinking though it is still large at around 12 million square kilometres in size. Outside the polar vortex, ozone values are highest over the Southern Ocean, particularly south of Australia and the Pacific sector where they reach over 400 DU. There are significant differences between the various satellite measurements. Temperatures in the ozone layer are rising rapidly and are generally close to or a little above the normal. They have risen above the PSC formation threshold of -78°C throughout the ozone layer, though some PSCs can still exist. The PSC area is now around 13 million square kilometres, a little larger than the average over the last decade. 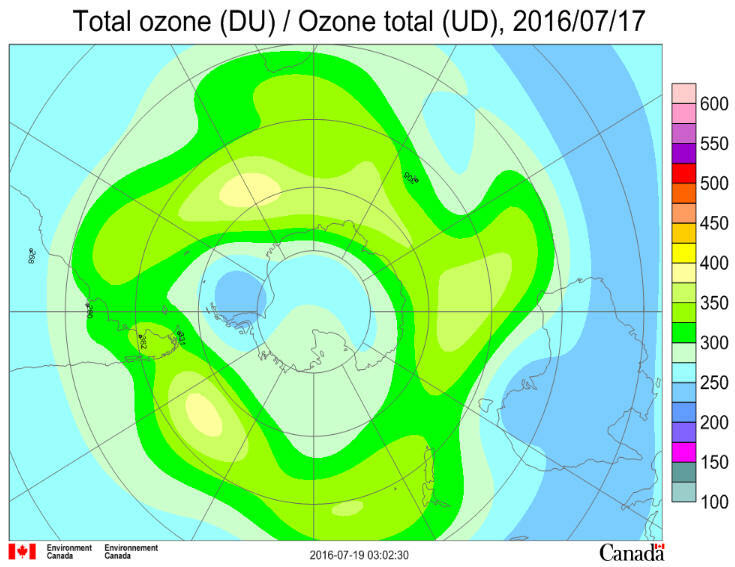 The ozone hole is expected to persist and perhaps intensify a little over the coming week. The 2016 ozone hole: The polar vortex formed over the winter, isolating the ozone layer over Antarctica. Stratospheric temperatures fell below -78°C through much of the ozone layer, leading to the formation of polar stratospheric clouds. With the return of sunlight ozone depletion took place leading to the formation of the 2016 ozone hole. 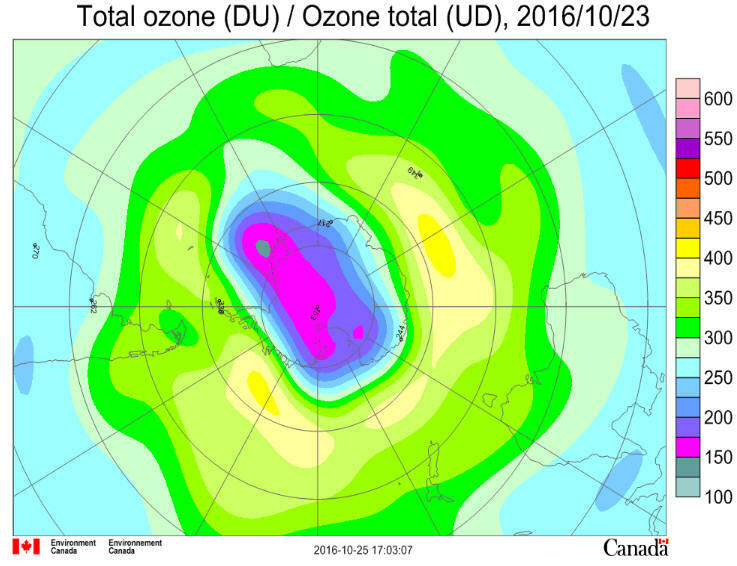 Ozone values dropped to around 130 DU at the centre of the ozone hole in early October, but were around 360 DU just outside the polar vortex. During August the ozone hole was larger than in either 2015 or 2014, but during September it was smaller in size than 2015, though mostly larger than 2014. In the first half of October it was comparable to the decadal mean at around 19 million square kilometres. A short lived warming took place in early September. At its largest in late September the hole covered just over 20 million square kilometres. The PSC area reached its maximum size of around 26 million square kilometres in early August broadly comparable to the mean of the last decade. It shrank and the PSC area was around 15 million square kilometres in mid September, near its seasonal lowest over the last decade, however it remained near this size into October. It is now around 13 million square kilometres, a little larger than the average over the last decade. The edge of the ozone hole clipped the tip of South America, the Falkland Islands and South Georgia over September 1 to 5 and September 12, 27 to 30, October 8 to 15. Antarctic ozone today: The 2016 ozone hole remains near its deepest, with lowest amounts, around 140 DU, near the centre. It is roughly triangular and centred over the Weddell Sea, but is forecast to become very elliptical over the next week. The hole covers a sizable fraction of the continent, apart from Wilkes Land south of Australia. It remains near its largest at around 18 million square kilometres. Outside the polar vortex, ozone values are highest over the Southern Ocean, particularly south of Australia where they reach over 400 DU. There are significant differences between the various satellite measurements. Temperatures in the ozone layer have passed their winter minimum and are generally close to or a little below the normal. The PSC area is now around 13 million square kilometres, a little larger than the average over the last decade. Some of the ozone layer over the continent remains below the threshold for Polar Stratospheric Cloud (PSC) formation, and ozone depletion is still taking place. Temperatures have already risen above the PSC threshold in the highest part of the ozone layer and are generally rising. The part of the polar vortex with air below -78°C has passed its maximum size and is generally shrinking. The 2016 ozone hole: The polar vortex formed over the winter, isolating the ozone layer over Antarctica. Stratospheric temperatures fell below -78°C through much of the ozone layer, leading to the formation of polar stratospheric clouds. With the return of sunlight ozone depletion took place leading to the formation of the 2016 ozone hole. Ozone values dropped to around 130 DU at the centre of the ozone hole, but were around 360 DU just outside the polar vortex. During August the ozone hole was larger than in either 2015 or 2014, but during September it was smaller in size than 2015, though mostly larger than 2014. In the first half of October it was comparable to the decadal mean at around 19 million square kilometres. A short lived warming took place in early September. At its largest in late September the hole covered just over 20 million square kilometres. The PSC area reached its maximum size of around 26 million square kilometres in early August broadly comparable to the mean of the last decade. It shrank and the PSC area was around 15 million square kilometres in mid September, near its seasonal lowest over the last decade, however it remained near this size into October. It is now around 13 million square kilometres, a little larger than the average over the last decade. The edge of the ozone hole clipped the tip of South America, the Falkland Islands and South Georgia over September 1 to 5 and September 12, 27 to 30, October 8 to 15. Antarctic ozone today: The 2016 ozone hole is near its deepest, with lowest amounts, around 130 DU, over the polar plateau. It has become somewhat elliptical and currently extends towards Africa. The hole covers much of the continent, apart from the coastal fringes south of Australia. It is near its largest at around 20 million square kilometres. Outside the polar vortex, ozone values are highest over the Southern Ocean, particularly south of India where they reach over 400 DU. There are significant differences between the various satellite measurements. Temperatures in the ozone layer have passed their winter minimum and are generally close to the normal. Through much of the ozone layer over the continent they are below the threshold for Polar Stratospheric Cloud (PSC) formation, and ozone depletion is still taking place. Temperatures have already risen above the PSC threshold in the highest part of the ozone layer and are generally rising. The part of the polar vortex with air below -78°C has passed its maximum size and is now generally shrinking though the area has not changed much in the last fortnight and has increased in the last few days. The 2016 ozone hole: The polar vortex formed over the winter, isolating the ozone layer over Antarctica. Stratospheric temperatures fell below -78°C through much of the ozone layer, leading to the formation of polar stratospheric clouds. With the return of sunlight ozone depletion has taken place leading to the formation of the 2016 ozone hole. 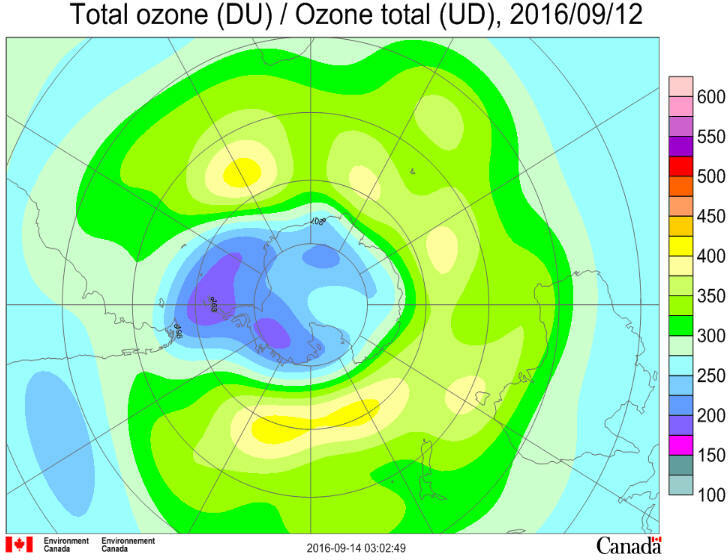 Ozone values are around 130 DU at the centre of the ozone hole, and around 360 DU just outside the polar vortex. During August the ozone hole was larger than in either 2015 or 2014, but it is now smaller in size than 2015 and comparable to the long term mean at around 20 million square kilometres. It is larger than in 2014. A short lived warming took place in early September. The PSC area reached its maximum size of around 26 million square kilometres in early August broadly comparable to the mean of the last decade. It shrank and the PSC area was around 15 million square kilometres in mid September, near its seasonal lowest over the last decade. It is now around 17 million square kilometres, a little larger than the average over the last decade. The edge of the ozone hole clipped the tip of South America, the Falkland Islands and South Georgia over September 1 to 5 and again on September 12. 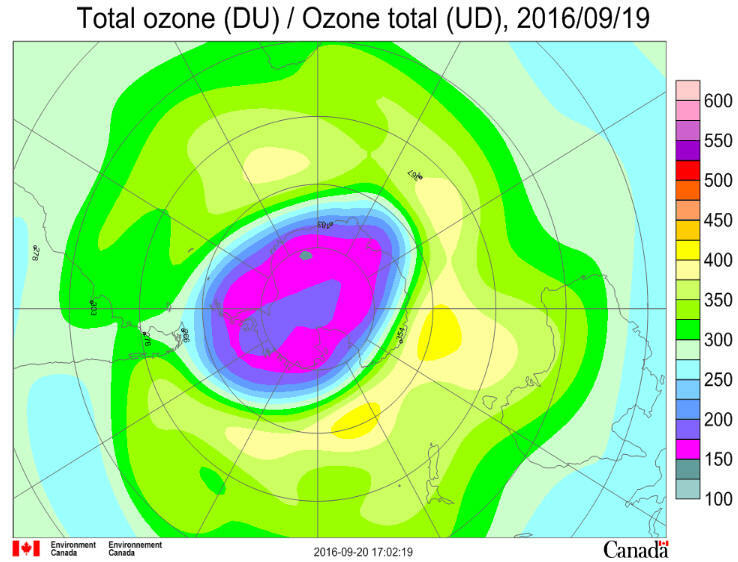 Antarctic ozone today: The 2016 ozone hole is deepening, with lowest amounts, around 140 DU, over Mac. Robertson Land. The hole covers much of the continent, apart from the coastal fringes of Wilkes Land. It is near its largest at around 18 million square kilometres. Outside the polar vortex, ozone values are highest over the Southern Ocean, particularly south of Australia where they reach 430 DU. There are significant differences between the various satellite measurements. Temperatures in the ozone layer have passed their winter minimum and are generally a little above the normal. Through much of the ozone layer over the continent they are below the threshold for Polar Stratospheric Cloud (PSC) formation, and ozone depletion is taking place. Temperatures have already risen above the PSC threshold in the highest part of the ozone layer and are generally rising. The polar vortex has passed its maximum size and is now shrinking. The 2016 ozone hole: The polar vortex formed over the winter, isolating the ozone layer over Antarctica. Stratospheric temperatures fell below -78°C through much of the ozone layer, leading to the formation of polar stratospheric clouds. With the return of sunlight ozone depletion has taken place leading to the formation of the 2016 ozone hole. 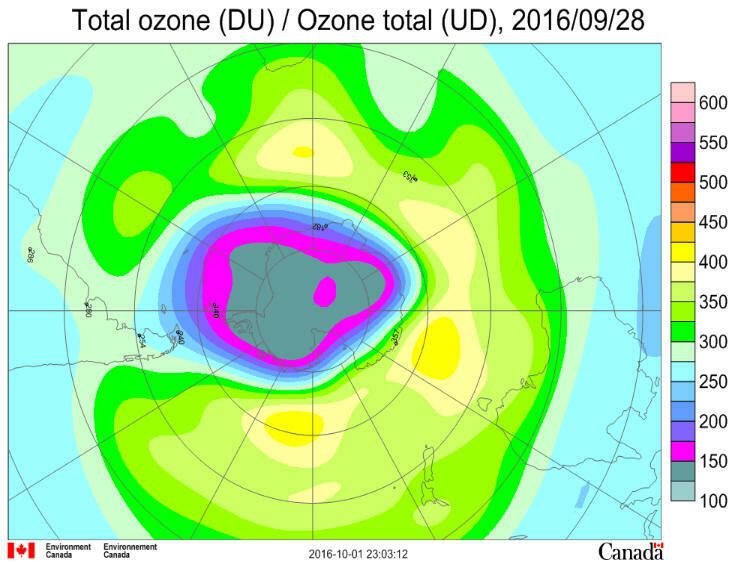 Ozone values are around 140 DU at the centre of the ozone hole, and around 360 DU just outside the polar vortex. During August the ozone hole was larger than in either 2015 or 2014, but it is now smaller in size at around 18 million square kilometres. The PSC area reached its maximum size of around 26 million square kilometres in early August broadly comparable to the mean of the last decade. It has shrunk and the PSC area is now around 15 million square kilometres, near its seasonal lowest over the last decade. The edge of the ozone hole clipped the tip of South America, the Falkland Islands and South Georgia over September 1 to 5 and again on September 12. Antarctic ozone today: The ozone distribution is that of late winter with ozone amounts lowest over the continent and declining, but building around it now that the polar vortex is established. The vortex is somewhat elongated, stretching along the Antarctic Peninsula. Ozone values currently range from around 210 DU to over 400 DU. They are lowest over Dronning Maud Land and highest over the Southern Ocean, particularly in the Indian Ocean sector. There are significant differences between the various satellite measurements. Temperatures in the ozone layer are at their winter minimum and are generally close to the normal. Through much of the ozone layer over the continent they are below the threshold for Polar Stratospheric Cloud (PSC) formation, so that it is possible for ozone depletion to take place. Temperatures have already risen above the PSC threshold in the highest part of the ozone layer. The 2016 ozone hole: The polar vortex has formed, isolating the ozone layer over Antarctica. Stratospheric temperatures have fallen below -78°C through much of the ozone layer, leading to the formation of polar stratospheric clouds. 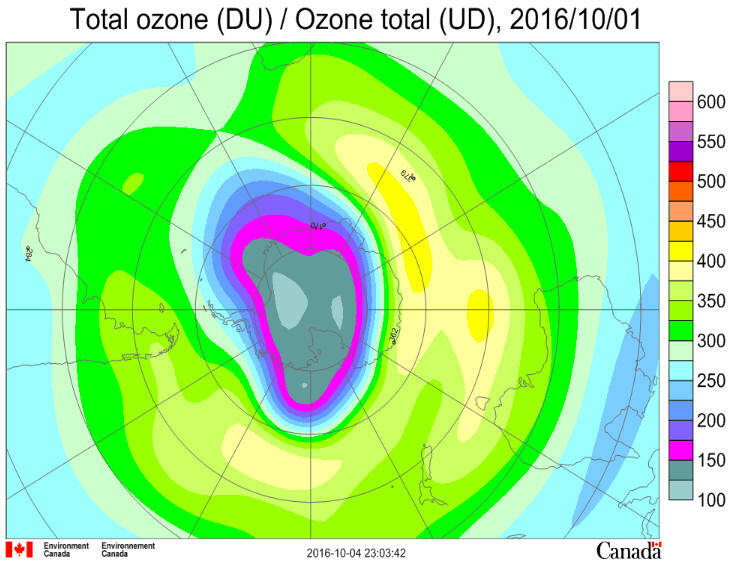 Ozone values are around 250 DU over the continent, and around 360 DU just outside the polar vortex. Antarctic ozone today: The ozone distribution is that of late winter with ozone amounts lowest over the continent and declining, but building around it now that the polar vortex is established. The vortex is roughly circular. Ozone values currently range from around 210 DU to over 400 DU. They are lowest over Coats Land and highest over the Southern Ocean, particularly in the Pacific sector. Much of the Antarctic Peninsula is currently outside the vortex and stations there are therefore reporting high ozone values. There are significant differences between the various satellite measurements. Temperatures in the ozone layer are at their winter minimum and are generally close to the normal. Through much of the ozone layer over the continent they are below the threshold for Polar Stratospheric Cloud (PSC) formation, so that it is possible for ozone depletion to take place. Temperatures have already risen above the PSC threshold in the highest part of the ozone layer. The 2016 ozone hole: The polar vortex has formed, isolating the ozone layer over Antarctica. Stratospheric temperatures have fallen below -78°C through much of the ozone layer, leading to the formation of polar stratospheric clouds. Ozone values are around 260 DU over the continent, and around 350 DU just outside the polar vortex. Antarctic ozone today: The ozone distribution is that of early winter with ozone amounts lowest over the continent and declining, but building around it as the polar vortex becomes established. The vortex is roughly circular. Ozone values currently range from around 260 DU to nearly 400 DU. They are lowest over the Brunt Ice Shelf and Antarctic Peninsula and highest over the Southern Ocean. There are significant differences between the various satellite measurements. Temperatures in the ozone layer are still cooling from their summer peak and until recently were generally close to the normal. They are currently a little cooler than the normal. Through much of the ozone layer over the continent they are now below the threshold for Polar Stratospheric Cloud (PSC) formation, so that it is possible for some ozone depletion to take place. The 2016 ozone hole: The polar vortex has formed, isolating the ozone layer over Antarctica. Stratospheric temperatures have fallen below -78°C through much of the ozone layer, leading to the formation of polar stratospheric clouds. Ozone values are around 270 DU over the continent, and around 330 DU at the outer edge of the polar vortex.